Apple has announced the date of its next big event: block out your diary at 10am San Francisco/6pm UK on 12 September 2018. While Apple hasn't mentioned any specific products, it announces new iPhones at this time every year, so we're 99.99999% certain we're looking at the new 2018 iPhone launch event. All the rumours suggest a bigger version of the iPhone X, as well as a lower-cost iPhone with an LCD screen. There are also rumours that Apple is working on a redesigned Apple Watch Series 4 with a circular screen, and if you're into reading the Apple tea leaves from its invitation images (which often do give small hints), maybe that's what you'd expect here. Or maybe it's a just a reference to Apple's giant ring headquarters, where the event is taking place. Maybe the gold effect on the text and image means Apple's flagship phone will get that finish back – you can only get a gold finish on the iPhone 8 models currently. Perhaps we'll hear about upgraded AirPods too, and surely the much-delayed AirPower charging mat will appear at last. 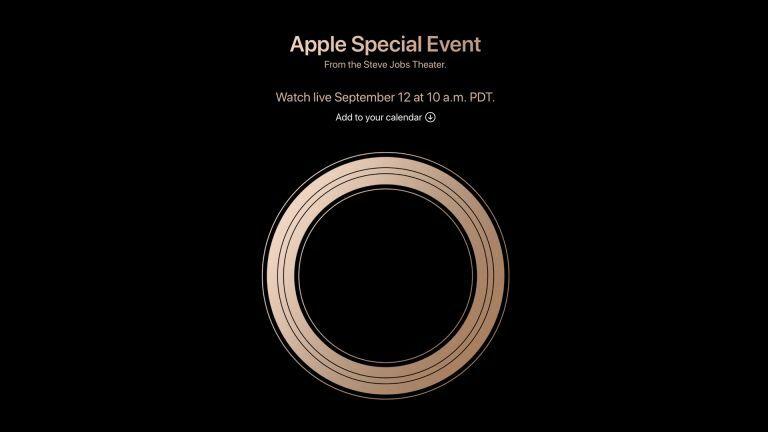 As is usually the case with Apple's events these days, you can watch the livestream on Apple's site.